New Wave Lacrosse is a high-caliber & multi-faceted lacrosse training organization headquartered in the Western Suburbs of Chicago-land. Our programs leverage unparalleled skill, passion, and knowledge from our dedicated coaching staff to provide the highest quality lacrosse experience possible for our players. Our focus is making sure that every single player who walks through our door meets their collegiate, personal and athletic goals. We do this by creating a strong, close-knit community with our families, leveraging the knowledge & leadership of our brilliant lacrosse coaches, and utilizing our extensive lacrosse networks across the country. We offer various lacrosse programs for different ages, skill levels, grades and goals. From beginners to elite, New Wave Lacrosse provides the most comprehensive, personalized and high-quality lacrosse experience available for players at every stage of their lacrosse career. It is our goal to develop student athletes of success and integrity. We strive to help our players serve as positive members of their teams, their class, their families and the community as a whole. We aim to not only uphold our name as a premier athletic organization, but also to instill a positive attitude in our athletes so they are willing to recognize the importance of mental/physical growth in the development of their lacrosse skills. At the end of the day, our families' goals are our goals and we look forward to reaching them every season. The organization may be new but the names behind it are not. 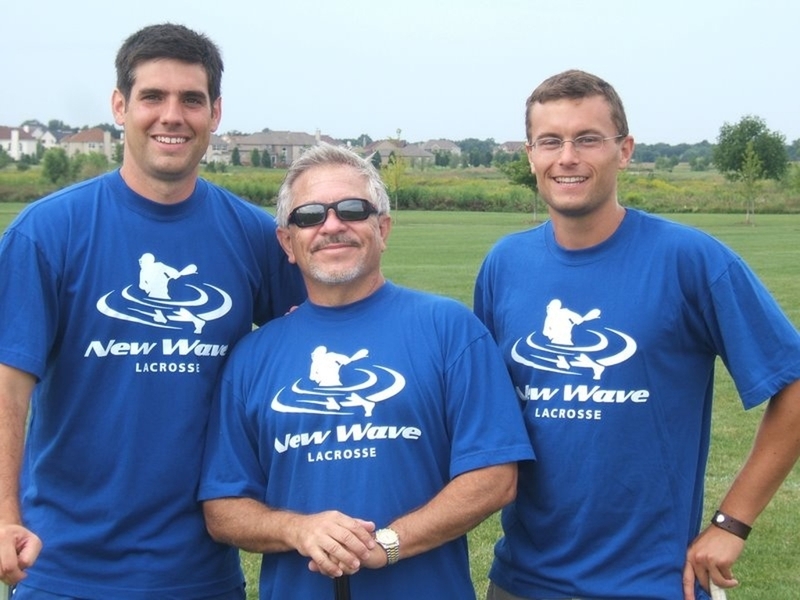 New Wave Lacrosse was formed by Paul Stolzer, Andy Thompson and Kyle Sullivan in 2009 (the former lacrosse staff and coaches of Players Indoor). Though the concept is fresh and unmatched and the name is new, the players and coaches making it all happen have been doing so for a long time, and we are still dedicated to preparing young athletes for the field of competition at all levels, from beginners to collegiate players. With combined lacrosse playing and coaching experience totaling over 50 years (wow !) we understand the importance of promoting teamwork, sportsmanship, positive coaching and having fun as well as advancing the sport of lacrosse. In addition to these basic philosophies, we all take an enormous amount of pride in our success in assisting over 150 of our current/former players in reaching their personal goal of playing at the college level (D1, D2, D3 and high level clubs) over the past 2 years including such lacrosse power house schools as Univ. of Virginia, Michigan State, Hofstra, Stony Brook, Ohio State, Augustana, Boulder, Denison, Ohio Wesleyan, Mt. St. Mary’s, Albany, Manhattan, Ohio State, Sienna, Bellarmine, Carthage and Stevenson (to name only a few). The national lacrosse family is more tightly knit than you may think. Our directors, staff members and coaches all have relationships with colleges across the country - if they aren't already a coach there, that is! In addition to a handful of current college coaches on our staff, we have countless more in our corner that are always looking for candidates with talent, integrity and character. If you aspire to play at the next level, New Wave Lacrosse is a fantastic resource for you to leverage. Lacrosse is serious business. Playing for your neighbors start-up lacrosse club is a wonderful experience with its own value, but at a certain point you need a professional staff of professional coaches with professional experience to realize your full potential. We are accessible: whether you call or email us, someone gets back to you in a professional, timely manner. We care about our players and our families and treat the whole organization as a family. We are focused on lacrosse: here and now. We operate in Illinois for Illinois players. There are no other locations for New Wave Lacrosse that could take our focus away from you. "Big Box" or multi-state lacrosse clubs have watered down programs because they are trying to services too many locations at once. We are here for you and our focus is here in Illinois, and that allows us to maximize and personalize your lacrosse experience. New Wave was founded in 2010 and has been growing strong ever since. For seven years, we have provided a strong foundation for players and families to place their trust in. What's even more staggering is that our staff is virtually identical to it was at inception - the only difference being those that we've added with our humble growth. There is a lot of value in consistency and it is increasingly rare in the world of youth sports. New Wave is not only an affordable program, but offers great value for your dollar. We never want money to be the issue that prevents a player from experiencing lacrosse, so we work with families on a personal financial level for many of our lacrosse programs. This is a benefit of having access to a regional professional company that provides personalized attention to their families. New Wave Lacrosse has sent over 200 players to college since 2010, and that's only counting our club program. Include all of the players who attended a New Wave league, skill clinic, camp or combine, and that number quadruples. Our alumni network has opened doors for many players in both athletic and professional ways.